Co-housing consists of a housing development planned and executed by a group of people who would like to live near one another. Sometimes the households are strangers before responding to an invitation to share in the development of their own housing. Occasionally groups of friends or acquaintances recognize their common need for a particular type of housing. 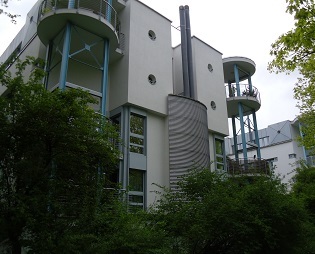 Often the co-housing project evolves after months or years of conversation about how participants would like to share common ground or buildings, what type of interpersonal community building they envision, budgets, chores, architectural styles, locations, and transportation needs and preferences. More often than not, the group decides to build new attached or detached homes together, although substantial renovation of an existing complex also is possible. Ownership of the development then often takes the form of a cooperative. The problem is that in the U.S., outside of New York, most financial institutions don't know how to deal with co-ops and don't have an incentive to learn. This idea has been around since the late 1970s and early 1980s, and there are more than 100 known groups in the U.S. A typical co-housing development might include anywhere from 5 to 70 households. Most of them we know about personally consist of 20-30 separate families or singles. This style of housing is not a commune in the sense of pooling of money. Some people might consider it to be communal housing, but these distinctions strike us as being beside the point. While we think this is a fringe movement at this time, due in no small part to the intransigence of the financing issue, we will mention a few salient points in the hope that anyone contemplating forming a co-housing development can find some tips. It is possible that this discussion will shake up a few of your preconceived notions about what is essential or even desirable in housing. The reasons someone would start exploring co-housing vary widely. Usually there is an initial attraction to the idea of living in community with other people, while not actually sharing the same housing unit. Often there are altruistic beliefs or shared faith behind the development. Frequently these are environmental sustainability ideals, in which concepts such as avoiding duplication of housing materials and appliances becomes very appealing. This type of development may be termed an ecovillage, and it may go way beyond sustainable building materials to include gardening, farming, major composting, or living off the land. Another type of altruistic motivation may be the desire for living in a mixed-income housing situation, but realizing that there is very little choice of naturally mixed income neighborhoods in one's particular metropolitan area. Sometimes people just want to be very social, and would like to avoid the isolation of being with only a certain age group, ethnicity, or socioeconomic class. Paradoxically, often the motivations are anti-materialistic, but it's the financing of this entire development that becomes a nightmare. Banks and mortgage companies like uniform, predictable products that will hold their resale value. Any real estate agent will tell you that something quite novel in a home usually means it will take longer to sell, as even ordinary buyers are fearful they won't be able to resell it at will. Imagine now that you've built a little complex of medium-sized and small houses around a courtyard, built a large meeting room with a large institutional-style kitchen in it in the middle of the courtyard, and have a few strange notations about chicken coops and large-scale composting bins on your blueprints. Now you have a banker's nightmare. What started out to be highly economical, such as the lack of individual kitchens in each unit, usually blossoms into something expensive as the people involved begin to express all their wants and needs, and as they then look for land where both the zoning and the ambiance will accommodate their wishes. It's not at all unusual for the would-be intentional community members to need a consultant to help them organize the entire project and sometimes even help connect them with the three or four specialty builders who might bid on construction of this type of development. Sometimes the originators of the co-housing idea or opportunity are able to locate the other prospective participants simply by word of mouth, but more often they have to resort to some form of marketing or advertising. That means people who don't know each other, or who aren't even friends of friends, suddenly are talking about living together in a far more intimate environment than a subdivision or even a large apartment building. So the meetings begin. Topics to be discussed will include where to locate, square footage and amenities each unit would need, whether there would be any common areas and if so what they consist of, whether there would be required or optional common gatherings, and how the group would make decisions. Then when those decisions are made, a whole new round of questions may arise, such as how to make the financial arrangements fair, how house guests would be allowed and accommodated, noise, pets, parking, insurance, conflict resolution, eating preferences if there are to be common meals, and on and on. Often the co-housing idea breaks down here when the participants realize they really couldn't live in close proximity to one another, or can't really afford to buy into the group dream. If all of the interpersonal and financial dynamics go well, however, now there are institutional planning and zoning hurdles to be overcome. In an area with a land use zoning ordinance, an unorthodox grouping of housing units probably would be fit best either in a planned unit development (still sometimes called a PUD or simply a planned development) or through a newly applied form-based code overlay that would be procedurally the same as a zoning change. Incidentally, not all cities, townships, or counties even have a PUD or equivalent zoning classification, and many are not familiar with the form-based code concept and process. Now suddenly, in addition to convincing bankers and insurance agents, you have to enter into the political realm of zoning compliance or rezoning. This would entail convincing potential neighbors that this is an innocuous grouping of compatible people and that the development won't hurt their property values. In sum, co-housing is such a noble idea. It's hard to argue with having to buy only one piano, needing to outfit only one really big kitchen and large party space, extra “eyes on the street” almost constantly, built-in babysitters and elderly caretakers, and being really good friends with your neighbors. Yes, it's a little countercultural, but it's not menacing to the rest of us in any way. If you think you are a potential co-housing resident, it's best to get more information and leads on groups that are forming or accepting new members from the Cohousing Association. Cohousing difficulties shouldn't be underestimated at all. We would like to see less time-consuming alternatives, such as groups attempting to buy up all of the property on a cul-de-sac and maybe an adjoining street, with the goal of trying a suburban retrofit. Opening up a cul-de-sac to improve circulation is an altruistic purpose, and in the end all those financing difficulties that can stall a project for years can be avoided. Yes, you probably will not find an entire cul-de-sac for sale except in areas hit hard by foreclosure, but if you can find several homes within easy walking distance, and gradually buy up the others as they come on the market, you have a much easier financing project and also have plausible resale homes whenever someone wants to move. Another alternative is to buy an existing multi-family building and start ripping out walls until every household has a renovated space suitable to its needs and pocketbook. Many people object to common walls with neighbors, but those who would consider co-housing in the first place may be quite open to this option. In this case, square footage as a percentage of all square footage in the building should give a fair way to divide up the bills. The difficulty of course comes in finding the next investor who wants the same amount of space as the one who needs to leave. However, we recommend both of these as an alternative to constructing new co-housing units unless all the parties involved have an ample supply of time, money, and patience to wade through all the difficulties of the co-housing arrangement. The healthy driver for most of the co-housing movement is simply a desire for a deeper sense of community and equality of participating in something greater than one’s own nuclear family. Increasing our tolerance for other differences and expanding our world view are very important to today's society, so we shouldn't dismiss these people as kooks. Instead, it's critical to our survival that we begin to see ourselves as interdependent on this planet, and whatever we can do to overcome isolation and teach people how to get along is commendable.